Balua ONE was the first in an expected series of launches with the goal of testing both equipment and necessary logistics. Reaching the edge of space for the first time and maybe get some cool pictures in the process was about to became a reality! Properly test all electronic devices and sensors at different flight phases. Verify both SPOT and APRS location systems. Test payload resistance and damage tolerance during descent and landing. 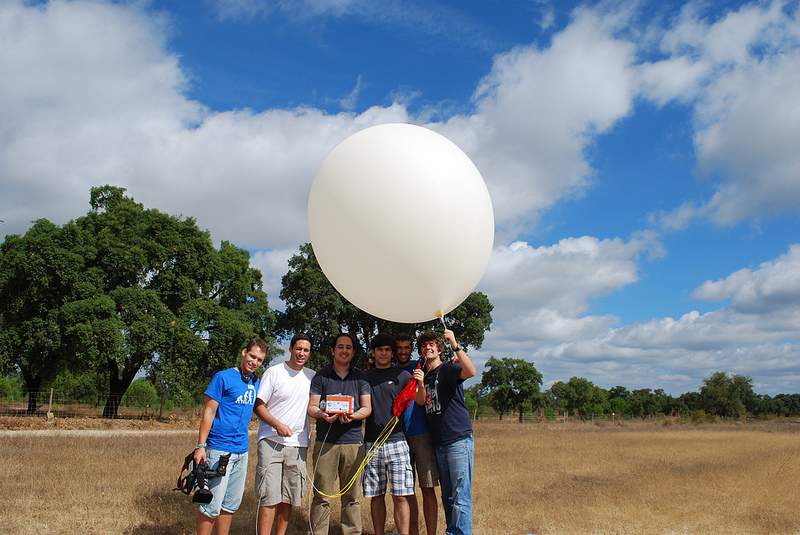 Confirm the logistics which is associated with balloon preparation and finding the payload. 2 temperature sensores – analog Low Voltage Temperature Sensors – TMP36 (outside, inside). 6x AA Lithium Energizer batteries. The main flight computer was a custom PCB with an ATmega328 running the arduino bootloader. Also on-board is a 3.3V voltage regulator and a Radiometrix HX1 (VHF transmitter, hard-tuned to 144.8 MHz which outputs 300mW (draining 120mA at full RF). The flight computer also connects to the Venus638FLPx module and receives data from 2 temperature sensors, a pressure sensor, a magnetometer and a 3-axis accelerometer. All data is stored on an on-board microSD card. All systems are powered by 6x AA Lithium Energizer batteries. 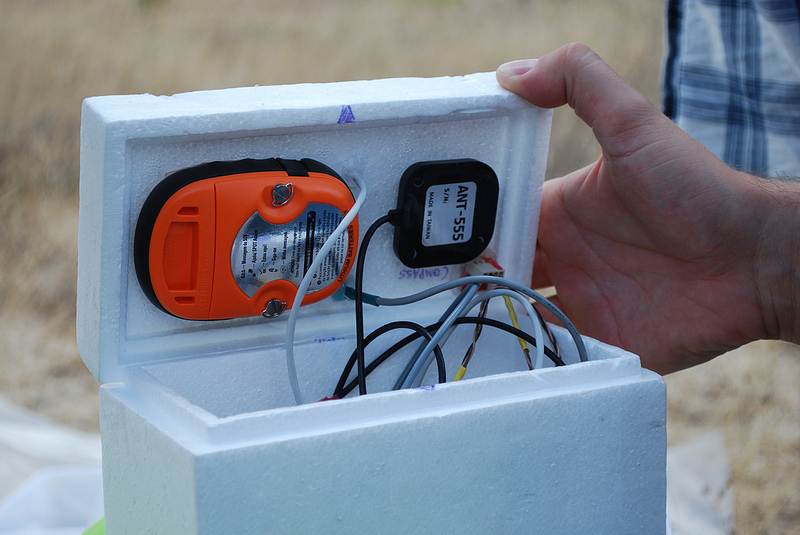 A buzzer was also fitted to facilitate locating the payload. Lastly, a chemical heater was embedded within the payload casing. As a backup system we have a SPOT satellite GPS Messenger. 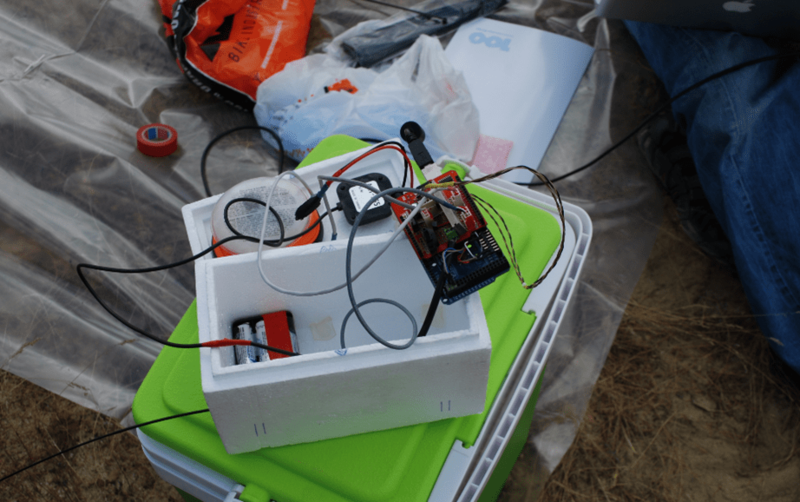 For this flight, we planned to launch the balloon in a location where the wind would take it away from the ocean. Very little information is known about floating balloons so it is difficult to predict what will happen! 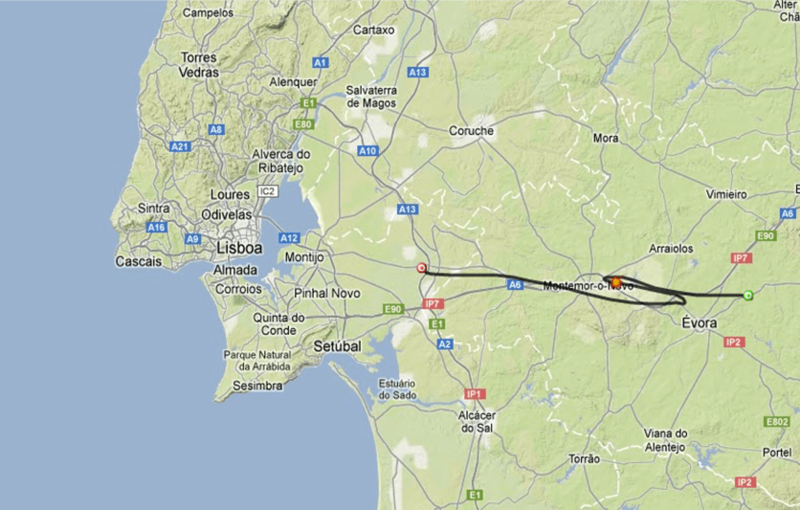 But we used a prediction tool and estimated the following flight plan. Really soon in the morning (about 6am) we left IST in direction to Alentejo. We are traveling and as we cross the river we see a clear blue sky and calm winds. Ideal conditions! However as we go further in the direction of the desired location we start to see clouds in the horizon. This is the moment that we make a decision of launching the equipment as soon as possible. We are close to the launching location and we see a good launching spot, it is not the planed position but the clouds are starting to appear. We park the car and start unloading the van and laying down the equipment. José gets to film the whole process, Duarte takes charge of the electronics, Miguel, Dário and Edmundo start filling the balloon, we are very nervous but Diogo takes over leading, correcting people and controlling the whole situation (he knows better than anyone else how to proceed). The checklist is continuously “checked” by everyone. After about 20 minutes we already the balloon almost filled, the electronics are set and the buzzer is beeping really loud, the GoPro is still off the spare battery (we have the large battery pack in the GoPro but we didn’t want to take any chances of loosing footage time), Diogo already confirmed that we have good APRS and SPOT communication with the balloon (GPS coordinates and sensor data are beeing sent correctly). In the checklist everything is done. Duarte calls the authorities responsible for authorization. After about 5-10 minutes we get a call back! We have auhorization! Launching time! We take one last group picture, turn on the GoPro and there he goes!!! We Launched it! BALUA ONE IS AIRBORNE! Seeing the balloon disappear into the blue sky is a beautiful thing. We immediately start loading the van and about 5 minutes after the launch we are set to go after the balloon. While we were packing someone says we forgot to put anti-fog in the camera lens! It was not in the checklist! We were a little disappointed about it but as we were getting good readings through all the communication devices we quickly forgot that and hoped for the best in terms of good quality pictures. We start travelling in the direction of the predicted landing site. As time goes by everyone starts to get really hungry. Miguel as brought lots of food but we were missing bread! We make a quick detour from the balloon and start tracking a bakery. Good bread from Alentejo! After eating and as we are going we make a shocking discovery! The GPS information stopped! Both primary and secundary tracking systems were shut down, we had no GPS information. We were completely blind! We start questioning everything. What did we did wrong? What would possible happen to shutdown simultaneously both the GPS information of APRS and SPOT which were completely independent in terms of power and communication? Maybe something was destroyed? Maybe the antennas shut down each other (it was never tested the SPOT and APRS antenas working so close to each other)? Either way we continued on our path to the landing site very disappointed. In our way we made a detour to Monsaraz castle which was the highest place in the area to see if there we would get some sort of aprs communication. Nothing. As time goes by and realizing that the balloon should already be down we decide to leave. As we are leaving we get a SPOT signal! SPOT is ALIVE! and really to the predicted landing site! As we go there we receive another SPOT signal! It is in same area! It is not moving, landed there! We go there as fast as we can believing that the flight computer and APRS were the culprits since the battery for that systems should already be drained out and only after that SPOT gave signal. In our way and as nervous as we were we introduced one number of the coordinates wrong and went to a completely different location (about 2km apart from the real landing site). I won’t go further in details about what we traveled, climbed and ran until we realize we were in the wrong site, but I can tell that involved crossing a gipsy camp, running from cows and travelling through rail lines, just crazy. In the end we did realize we were wrong and went to the landing location, it was a clear area with a few trees and after a few minutes we found the payload intact hanging from a tree! Amazing! We were so happy! We quickly recapture all the equipment, parachute, box, camera, sd cards, balloon remains and wires and proceed to analyze the data! We then checked the camera’s SD card. 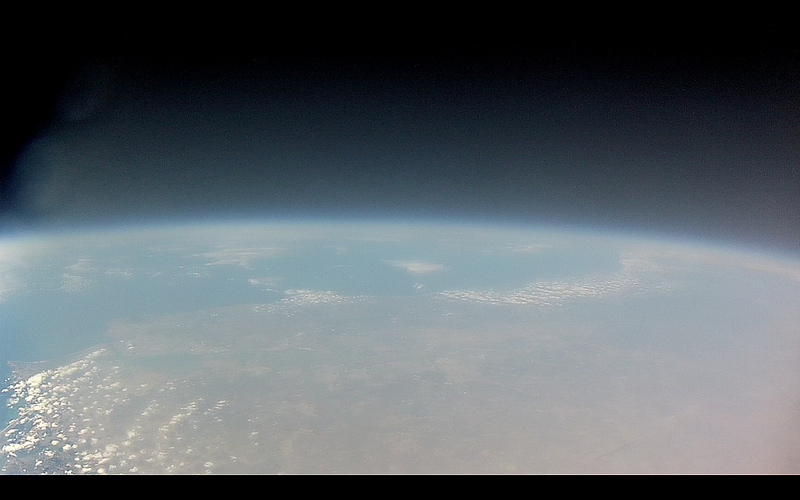 Amazing images but a little foggy (never forget anti-fogs), even though we got the whole launch filmed! Next we checked the SD card for sensor data and APRS. What we verified was that the flight computer was working correctly, reading sensors, writing data to the SD card and sending packages through APRS. The problem was the GPS data given by the Venus chip which was nothing. Basically the SPOT and Venus GPS antennas interfered with each other and shut down each other. Well live and learn! In conclusion we got a successful and also lucky launch. It was our first, we learned a lot and have a lot of points to improve. It was also a great trip, an amazing moment and experience to enjoy with friends. We also have the most awesome pictures and movies of our trip thanks to José’s camera skills. Go check it out in this website’s gallery section. As we can see the prediction tool was very accurate! 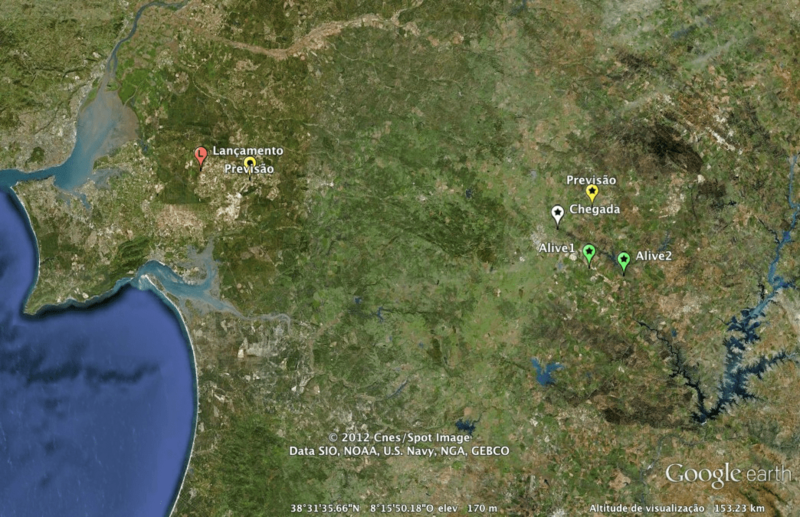 Just compare the distance between real and predicted launch sites against their landing counterparts! The following graphics show some of the obtained results. This data was collected by our sensors during flight and stored on the on-board microSD card. The heading graphic is shown below, it gives the orientation of the compass which is aligned with the camera in degrees (from 0º to 360º). 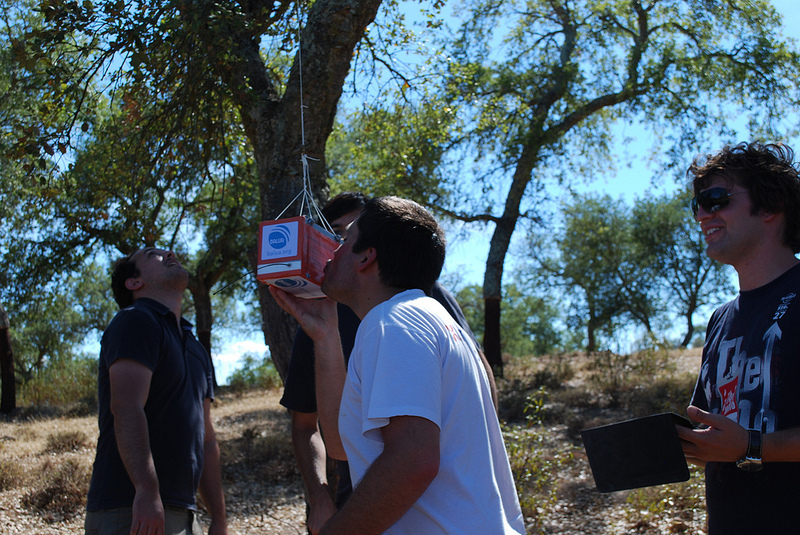 As we can see at the beginning of the launch the box is quite stable until it reaches more windy areas of the atmosphere. Notice also the stability of the balloon when it reaches really high (a sea of tranquility). Below we can see the evolution of the internal and external temperature of the box. The external temperature evolution is textbook accurate when compared with official graphics of the temperature evolution with height, reaching a minimum of about -40ºC. In blue,the real pressure sensor height is represented which in turn saturated and stabilized at 15Km. We propagated the height evolution linearly as it should be and cross checked with the inflection point of the temperature and acceleration graphics to know at which point did it burst (red line in the graphic below). It is possible to estimate that the balloon should have reached (with good confidence) a maximum height of approximately 30Km. The acceleration in the z axis (vertical) is the green line, the y axis (horizontal) is in yellow and x axis (longitudinal) is in blue. In this is possible to confirm the tranquility in terms of oscillations in all three axis as the balloon reaches higher and higher. The burst moment is also very clear. The values are between measured are between -512 and 512 which corresponds to -2G to 2G. The check list for the launching logistics is extremely important for launch efficiency. The check list was incomplete. The anti-fog in the camera is very important. The prediction tool was very accurate. The arduino’s 5V voltage regulator failed in flight (Arduino has a low voltage protection so the ATmega supply does not drop below 4.5V. When we tried to transmit data, voltage dropped and the ATMega would reset the whole system endlessly). SPOT and Venus GPS antennas interfered with each other. GoPro vision angle was adequate.